Job growth in Wisconsin remains generally weak, as reported by the Bureau of Labor Statistics, but that hasn’t kept graduates of the University of Wisconsin-Platteville’s Computer Science and Software Engineering programs from finding gainful employment. Since 2005, according to department chair Joe Clifton, three out of every four graduates have found work in the state, and most of the others have landed jobs in neighboring Iowa and Illinois. The department offers both a computer science and a software-engineering degree. Both are highly market-competitive degrees, though software engineering in particular garners a lot of respect. “Even if you have someone with a low GPA in software engineering, that person got a low GPA in a tough program. That person is still going to go out and get a job,” Clifton says. Computer science is a generalized degree. A student can, in fact, earn it and go on to become a software engineer—or a systems and applications programmer, analyst, or other such specialist, as he or she chooses. If anything, what sets the software engineering degree apart is the curriculum’s overall workload, in Clifton’s view. Students must complete more courses of math, science, and engineering than their counterparts in computer science, who have fewer required courses and more electives. All computer science students are required to take two software engineering courses, and they may opt to take more. “In the computer technology emphasis, everything the computer-science person would take, the software-engineering person would take that and more,” he says. One option that the computer-science students have is to pursue a degree track that emphasizes “Computer Information Systems,” or one whose emphasis is “Computer Technology.” The Computer Information Systems track prepares them to work in the business and financing world, such as at insurance companies or banks. The curriculum includes some specialized classes in information systems design and programming. There are some non-computer classes in accounting and business. The alternative route, Computer Technology, is a general computer-science degree focused on software development, with basic core courses, including a course in database systems and another in data communications and computer networking; along with some electives. This track also has “some of the more traditional computer-science courses,” according to Clifton: data structures, operating systems, assembly and programming language structures, among other subjects. 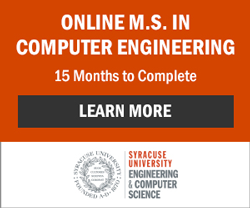 In both tracks, there is additionally a little software engineering thrown in the first two computer science courses. The Computer Technology emphasis students are required to take two software-engineering courses, and they may opt to take more—and in so doing, earn some extra software-relevant credentials that are shy of a degree but are still resume-worthy—if they see fit. “They could also say ‘I want to take software engineering classes. I don’t want to get a full-blown software engineering degree, but maybe I could get a software engineering title,’” Clifton points out. Both computer science and software engineering at UW-Platteville place much emphasis on software development, Clifton points out. Software engineering delves further into the engineering and quality aspects of software development and also requires students to take a few courses in another engineering discipline.. The program has more required courses and more project and team experience than the computer science major. UW Platteville students studying in the lab. Of all the software-engineering program’s unique requirements, the senior-year “capstone” project is paramount. It entails creating a new software program or app. The entire class, typically numbering around 20 students, works together on one project for both senior-year semesters. A local business will often be the project’s beneficiary; the students take up creating a program or app that the business would like to use. Several classes have taken up Esterline AVISTA, a Platteville-based software-engineering firm that Clifton says does contract work for many big corporations such as Rockwell, Honeywell and GE, as their clients. “They (Esterline AVISTA) are local, so it’s easy to be in touch with them on the projects’ requirements,” says Clifton. For instance, one class designed for Esterline AVISTA an ARINC simulator, a device to test the sensors on an aircraft’s systems to assure that they are all communicating properly. The simulator models various components to show how they will interact once the airplane powers on and starts running. “The simulator could say, ‘pretend you’re this sensor, and talk to that sensor,’” says Clifton. Computer science and software engineering share a lot of common ground at UW-Platteville, according to Clifton. Both instill students with the same fundamental skill: developing software. And both equip students with the credentials to find dozens of computer-related jobs through the career fairs that take come to campus every semester. Many area companies, including electronic retailer Colony Brands and medical software company Epic, scoop up computer-science and software-engineering graduates at career fairs. Students might also land jobs at companies after interning or working part-time for them before graduation. Esterline AVISTA finds some students to bring on board this way. Kohl’s, the national department store chain, also hires many UW-Platteville students to work on their software systems at their corporate headquarters in Milwaukee. Quite a few companies contact the Computer Science and Software Engineering Department and seek “co-op” arrangements, by which a student will work in their facilities during a semester and summer and earn credit for it. Clifton and his fellow professors gladly work out such arrangements, though Clifton says that it’s more common among the computer science students. Relatively few software engineering students take up co-ops or, for that matter, for-credit internships. Clifton says they, frankly, don’t have as much need for them. “We already require more credits to graduate (from the software-engineering program) than the university requires,” Clifton says, though he adds that those software-engineering students will take up for-pay, non-credit temporary work for software companies during the summers that they can put on their resumes. Esterline Avista is the only large software engineering company in Platteville so many graduating students set their sights on the farther-off metropolises of Madison and Dubuque. Milwaukee is another destination for some. In all types of communities and all types of industries, the region encompassing Wisconsin, Illinois, and Iowa holds a bounty of opportunities for computer science and software engineering graduates. Graduates will have to search, network, and interview like any other class of graduates, but they’ll do so with confidence of not being left wanting. “The good ones get the good jobs right away,” Clifton says. Read about Ann Lazare, a recent graduate of the UW Platteville Software Engineering Program...Read on here.